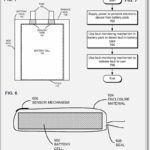 Andy Zaky, an analyst with Bullish Cross, has projected that Apple’s cash reserves will grow beyond $200 billion by the fourth quarter of 2013, according to a report by Fortune. With that, Apple could buy Intel, HP & Dell and still have change left over. Wow! 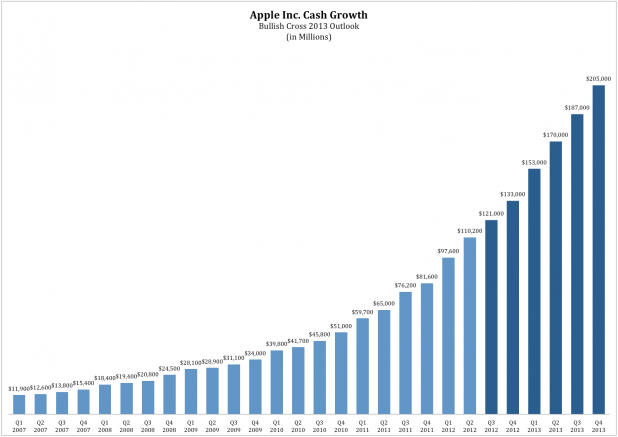 To give you a better idea, Apple had roughly $110 billion in cash at the end of March 2012. So this growth would represent an increase of $95 billion (86%) over the course of the next six fiscal quarters. In the annotated chart below the fold, he points out that by the end of fiscal Q4 2013, Apple’s cash per share will represent nearly 40% of the stocks’ current trading value. 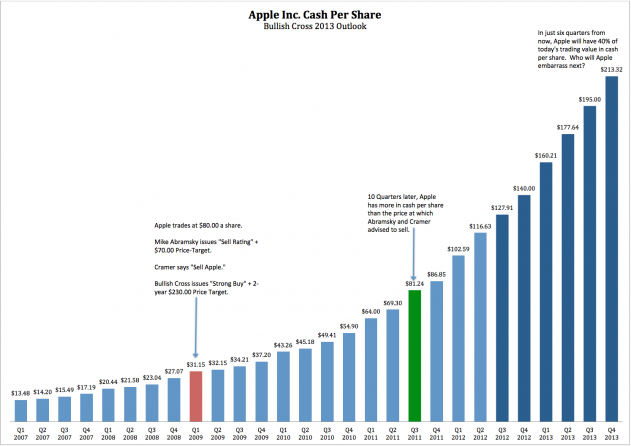 Apple’s cash pile has more than doubled between the fourth quarter of 2010 and the second quarter of 2012.